Have you ever wondered if eating raw cannabis works? What’s the point in going through the tedious efforts of cooking, vaping, and/or liquidizing cannabis — if you can simply eat it as it comes? Sure, you can consume raw cannabis, and more and more people are (it’s gaining recognition as a powerful superfood for its nutritional benefits). Although, if you have visions of munching on raw cannabis to get high or for medicinal benefits, then you will not be satisfied. That’s because the cannabis plant needs to go through a method known as decarboxylation to activate its nonpsychoactive cannabinoid THCA, a natural acid compound, into THC, the cannabinoid that gives cannabis its mind-altering effects. However, if the main goal is purely for health reasons, eating raw cannabis can be a beneficial green addition to your diet. Raw cannabis is packed with antioxidants that help protect the body from environmental free radicals. It’s great for anti-aging and protecting your skin from damage. Cannabis compounds are known to have anti-inflammatory, anti-spasmodic, anti-anxiety, and calming effects that help with pain management. As well as this, it’s been shown to have long-term benefits in fighting cancer. Raw cannabis and its cannabinoid acids — like THCA and CBDA — can offer help for inflammation and pain management. Research shows that CBDA and CBD can be used as an anti-seizure compound for treating epilepsy. Cannabis — raw or not — can dramatically decrease the number of seizures that a person experiences. With about 3.4 million Americans suffering from epilepsy, using cannabis as a form of treatment is certainly on the rise. Like kale and other nutritious greens, raw cannabis is packed with nutrients and fiber. That’s why healthy eaters are consuming it purely for its nutritional benefits and for its unique flavor, described as earthy, smoky, and nutty. Raw cannabis also packs a punch as a source of vitamin C (which helps boost immunity), vitamin K (which helps with calcium absorption and blood clotting), and is rich in iron, calcium, and folate (for blood and bone health and DNA repair). Unique terpenes in raw cannabis —which are responsible for giving plants their distinct smells and tastes — also help to promote relaxation, sleep, and calm. When smoked, terpenes get burnt, negating their health benefits. Of course, a big reason why people eat raw green vegetables is that they are full of fiber, which is necessary to keep our digestion tract in working order, and is beneficial in promoting healthy gut bacteria. However, raw cannabis can be a little rough on the stomach lining. It’s best to start with small amounts to gauge how your body and digestion reacts (some people report that too much can cause them heartburn). Be sure to eat fresh-picked cannabis. Raw buds should have clear flower glands, harvested before they turn amber in color. No matter how you’re eating it, be sure to wash raw cannabis thoroughly. Unless you personally know the source of your cannabis plants and are pesticide-free, the majority of cannabis grown in the United States is not organic. 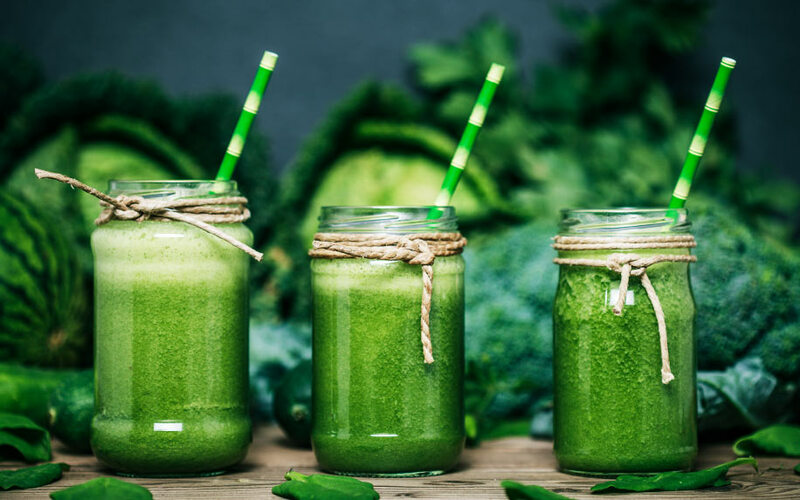 Just like with other greens, some of the tastiest ways to eat raw cannabis are in salads and smoothies or juiced as a green drink. All parts of a fresh cannabis plant are edible, so you can use raw leaves, stems, and flower buds as you would lettuce, kale or other greens in a salad. Although be aware that the leaves and stems are covered in fine, sticky hairs which makes them hard to swallow. Juicing is by far the most common way people are consuming fresh cannabis. It’s quick and easy and is the best way to break down the fibrous plant and buds. When it comes to portions, a serving of cannabis juice typically takes two large flower buds and about 15 leaves. After juicing, it’s highly recommended that you dilute the cannabis juice with other fruits or vegetables. Try juicing in a ratio of one-part cannabis juice to one-part juice. Cannabis juice is highly acidic and doesn’t actually taste very good by itself.